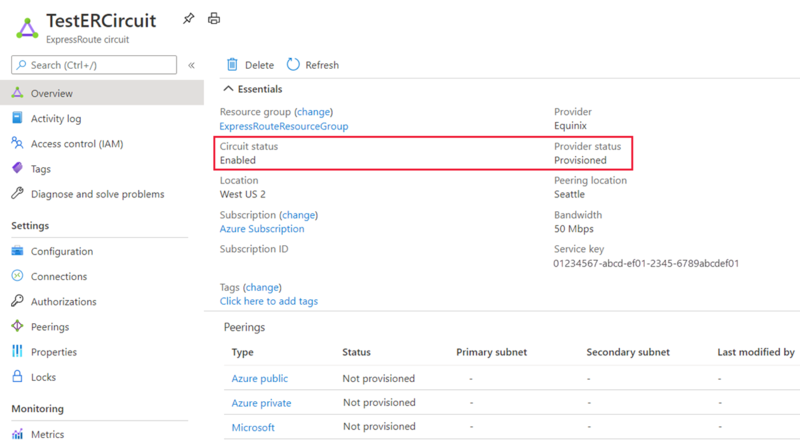 This article helps you create an ExpressRoute circuit using the Azure portal and the Azure Resource Manager deployment model. You can also check the status, update, delete, or deprovision a circuit. Review the prerequisites and workflows before you begin configuration. You can view a video before beginning in order to better understand the steps. Your ExpressRoute circuit is billed from the moment a service key is issued. Ensure that you perform this operation when the connectivity provider is ready to provision the circuit. After you click ExpressRoute, you'll see the Create ExpressRoute circuit page. When you're filling in the values on this page, make sure that you specify the correct SKU tier (Standard, or Premium) and data metering billing model (Unlimited or Metered). Tier determines whether an ExpressRoute standard or an ExpressRoute premium add-on is enabled. You can specify Standard to get the standard SKU or Premium for the premium add-on. Data metering determines the billing type. You can specify Metered for a metered data plan and Unlimited for an unlimited data plan. Note that you can change the billing type from Metered to Unlimited. You can't change the type from Unlimited to Metered. Peering Location is the physical location where you are peering with Microsoft. The Peering Location indicates the physical location where you are peering with Microsoft. 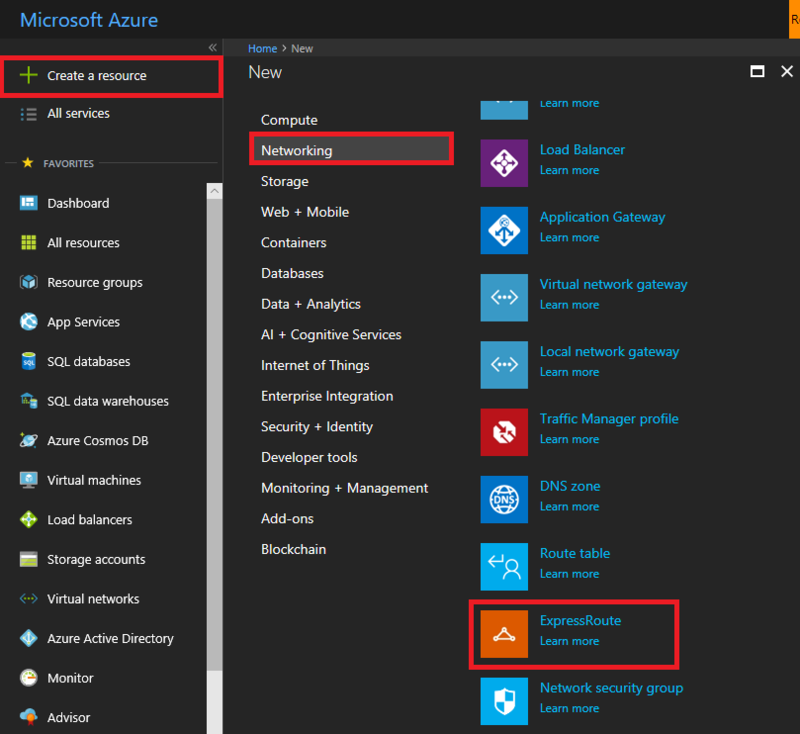 This is not linked to "Location" property, which refers to the geography where the Azure Network Resource Provider is located. While they are not related, it is a good practice to choose a Network Resource Provider geographically close to the Peering Location of the circuit. You can view all the circuits that you created by selecting All resources on the left-side menu. You can view the properties of the circuit by selecting it. 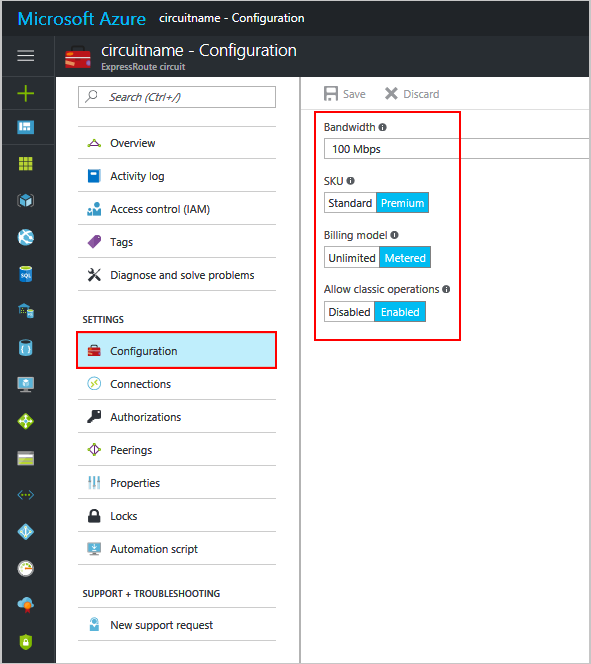 On the Overview page for your circuit, the service key appears in the service key field. You must copy the service key for your circuit and pass it down to the service provider to complete the provisioning process. The circuit service key is specific to your circuit. 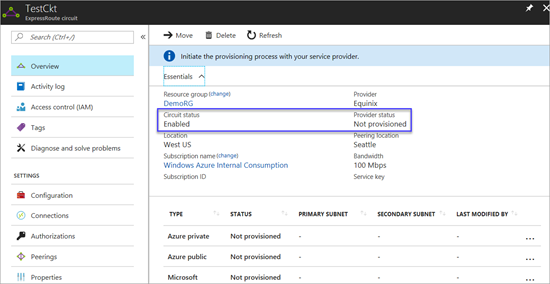 On this page, Provider status provides information on the current state of provisioning on the service-provider side. Circuit status provides the state on the Microsoft side. For more information about circuit provisioning states, see the Workflows article. You can view the properties of the circuit that you're interested in by selecting it. 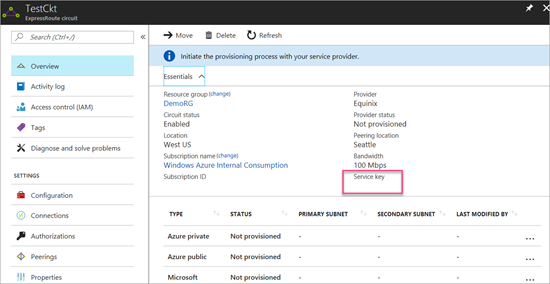 Check the Provider status and ensure that it has moved to Provisioned before you continue. For step-by-step instructions, refer to the ExpressRoute circuit routing configuration article to create and modify circuit peerings. These instructions only apply to circuits that are created with service providers that offer layer 2 connectivity services. If you're using a service provider that offers managed layer 3 services (typically an IP VPN, like MPLS), your connectivity provider configures and manages routing for you. Next, link a virtual network to your ExpressRoute circuit. Use the Linking virtual networks to ExpressRoute circuits article when you work with the Resource Manager deployment model. You can view the status of a circuit by selecting it and viewing the Overview page. You can modify certain properties of an ExpressRoute circuit without impacting connectivity. You can modify the bandwidth, SKU, billing model and allow classic operations on the Configuration page. For information on limits and limitations, see the ExpressRoute FAQ. Increase the bandwidth of your ExpressRoute circuit, provided there is capacity available on the port. Downgrading the bandwidth of a circuit is not supported. Change the metering plan from Metered Data to Unlimited Data. Changing the metering plan from Unlimited Data to Metered Data is not supported. Although you can seamlessly upgrade the bandwidth, you cannot reduce the bandwidth of an ExpressRoute circuit without disruption. Downgrading bandwidth requires you to deprovision the ExpressRoute circuit and then reprovision a new ExpressRoute circuit. Disabling the Premium add-on operation can fail if you're using resources that are greater than what is permitted for the standard circuit. To modify an ExpressRoute circuit, click Configuration. You must unlink all virtual networks from the ExpressRoute circuit. If this operation fails, check whether any virtual networks are linked to the circuit. If the service provider has deprovisioned the circuit (the service provider provisioning state is set to Not provisioned), you can delete the circuit. This stops billing for the circuit.